PLEASE NOTE: Our fountain pen does not apply to Pilot Namiki IC100 Fountain Pen Ink Cartridge. Please search Luxun ink and order the supporting ink. Fit out your pen with our universal Black and Blue Ink Cartridges (INK NOT INCLUDED) or refill with your favorite ink using the included ink converter (inside the pen). Just use water to flush the pen when switching colors. From nib to barrel,the finished product is a beautiful balance of form and function that demonstrates our commitment to outstanding craftsmanship. With the Bamboo Wood Pen in your possession,you are openly and unapologetically declaring your uniquesophisticated personal taste. The eco-friendly Bamboo Wood Fountain Pen set is equipped with the modern wood box to protect the fine gold medium nib. Great gifts feel good to give and receive. 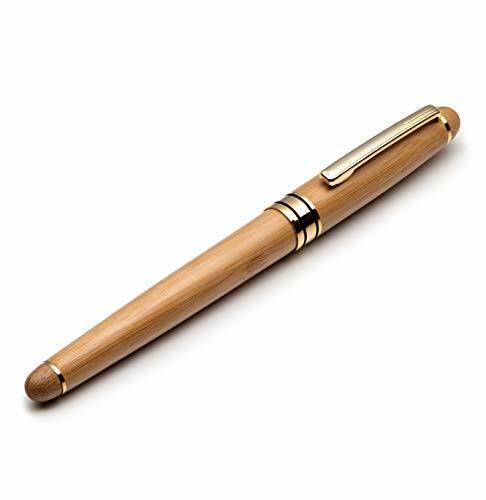 And with the Bamboo Wood Fountain Pen you are bound to see a grateful grin on the receiver's face,from beloved family members,favorite friends to important colleagues and valued clients. You're making a perfect choice for yourself or a luxury elegant gift for someone special in your life! BALANCED, NO-SPILL DESIGN All our pens are tested for both balance and a no-spill experience to guarentee a comfortable and consistent ink flow.The nib's innovative design dispenses a steady and smooth flow of ink no matter which angle you place nib to paper. MODERN CLASSIC:Smooth handwriting,easy flowing.The fountain pen was made of solid brass and bamboo wood,designed with stainless accents and nib. With the Modern Classic in your possession,clients,colleagues and friends will know you for your taste,class and sophistication. 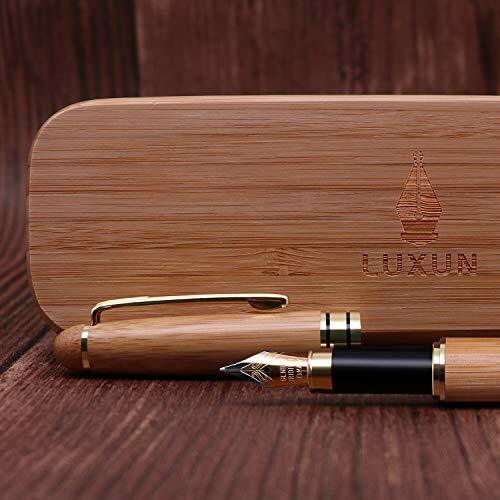 GIFT:Well-constructed and matching eco-friendly bamboo wood gift box,it is perfect for business signature ,handwriting or gift for any occasions.A short and durable fountain pen,convenient for travel or business trip. SATISFACTION GUARANTEED:All Luxun products guarantee with a 1-year free replacement WARRANTY!If any problems caused(like did not receive or pen did not work),please don't hesitate to contact us,we will try our best to help you solve the problems. Trust Precision Works To Bring You The Very Best In Quality & Value! With the Rosewood Pen in your possession,you are openly and unapologetically declaring your uniquesophisticated personal taste. The top rated Rosewood Fountain Pen set is equipped with the modern wood box to protect the fine gold medium nib. And with the Rosewood Fountain Pen you are bound to see a grateful grin on the receiver's face,from beloved family members,favorite friends to important colleagues and valued clients. MODERN CLASSIC:Smooth handwriting,easy flowing.The fountain pen was made of solid brass and rosewood,designed with stainless accents and nib. With the Modern Classic in your possession,clients,colleagues and friends will know you for your taste,class and sophistication. 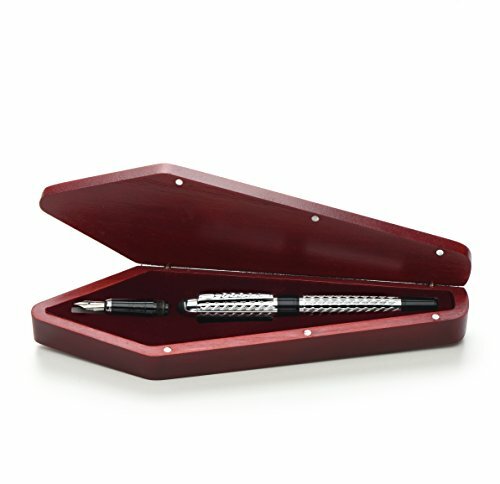 GIFT:Well-constructed and matching vintage style rosewood gift box,it is perfect for business signature ,handwriting or gift for any occasions.A short and durable fountain pen,convenient for travel or business trip. HENZIN handmade wooden fountain pen with ink refill converter is a fine writing pen which is beautiful affordable, perfect for beginner calligraphy business executive and signature writing. The unique classic fountain pen is an ideal gift for fathers, mothers, kids, friends, business, school, graduation. As the unique fountain pen is made of natural wood, the texture and color may different from each pen set as well as the picture. [HANDMADE PEN] HENZIN 100% natural wood pens handmade of walnut, enables you an antique fountain pen with comfortable grip. [MEDIUM NIB] The hand turned fountain pen has a nice medium nib which is best for calligraphy business executive and signature writing, writes smoothly. [REFILLABLE FOUNTAIN PEN] Easy for you to refill ink from ink cartridges(not included for safety) with ink refill converter includes inside the pen's barrel in seconds. 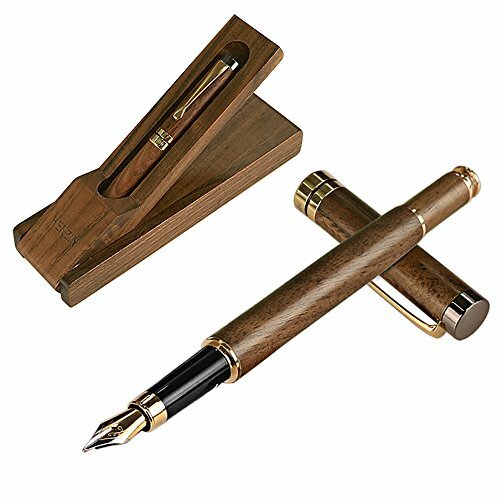 [VINTAGE GIFT] This cool fancy wooden pen comes with a luxury wood gift box, ends at an elegant vintage gift pen set for men and women, beginners, writers, students, colleagues and business. [WARRANTY] 30 days hassle-free warranty and 24h customer service. This security pen is different from the ordinary plastic pen. It is an aluminum alloy pen with a round adhesive base. The counter pen is ideal for any office scene, so you can find your pen at any time. If your pen is not fixed, the pen may be useless when it falls to the ground. The counter pen is a useful gift to give your family and friends. 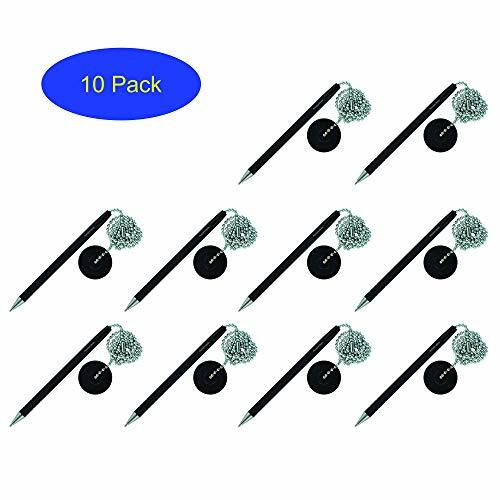 The pen on a chain is made of aluminum alloy, with the characteristics of anti-corrosion and anti-rust, the pen has a metallic texture, and the writing is smooth. The base is stainless steel, which is durable and not easy to fall. In offices and banks where pens are often used, your pen will disappear, often, or it will fall to the ground, causing the ink of pen to break. 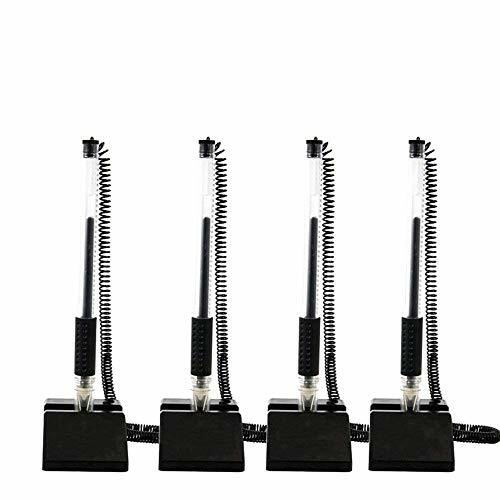 Our spring pen holder of security pen can fix the pen securely so it will not disappear. 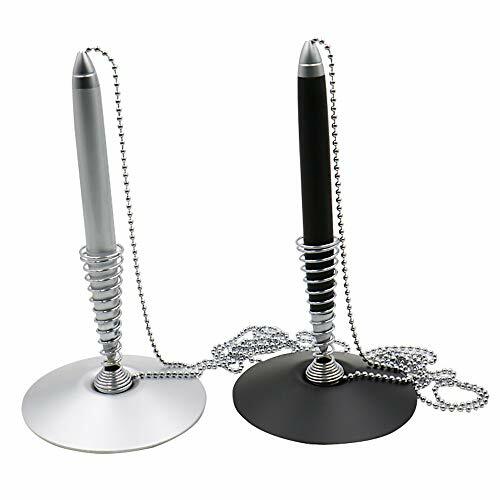 This desk pen with chain's length is 800 mm/31.5 inch, it is easy to write without limitation. No matter where your pen, you can find it easily. The base with adhesive can stick to any smooth surface. Our counter pen is a black ink ballpoint pen with a premium pen head, so the writing is smooth. When the ink is used up, you can change the refill easily, and the metallic color of the pen looks bright and elegant. Size: The length of the pen is 130 mm/5 inch, the diameter of the base is 76 mm/3 inch. 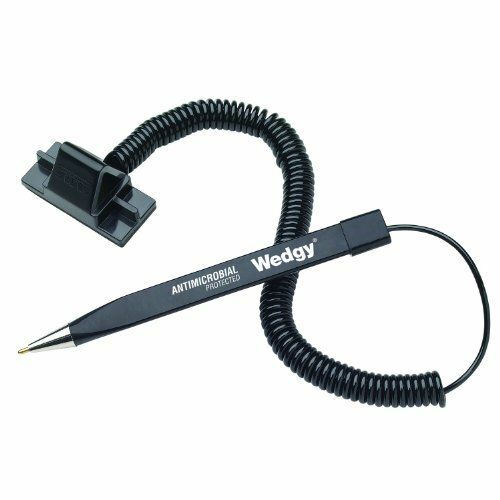 This pen with chain and base is medium in size and does not occupy the space to work. 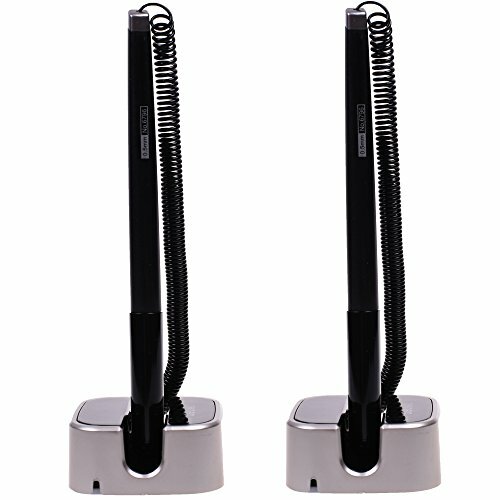 It is convenient when you need to use a pen, it will be a good helper for office. The Preventa 05059 is a counter pen with chrome plated brass tip, 24-inch ball chain with square adhesive base and Agion antimicrobial technology built in. 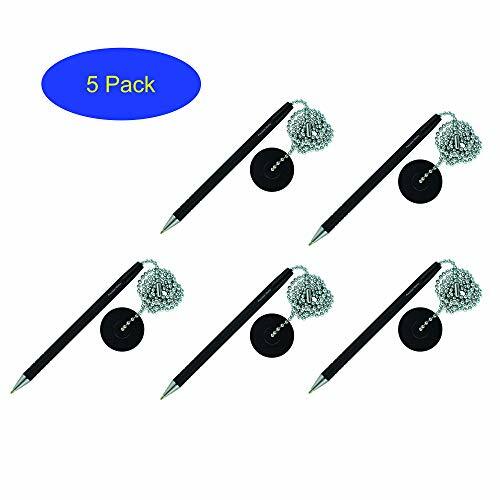 MyLifeUNIT Counter Pen 0.5mm, Gel Ink - Rubber Grip - Black The adhesive base attaches to any surface--telephone, wall desk, clipboard or counter. The black ink pen has a cord that can keep your pen walking away. Pack of 4 counter pens, color comes in RANDOM: Matt Brown color base or Matt Silver tone color base. 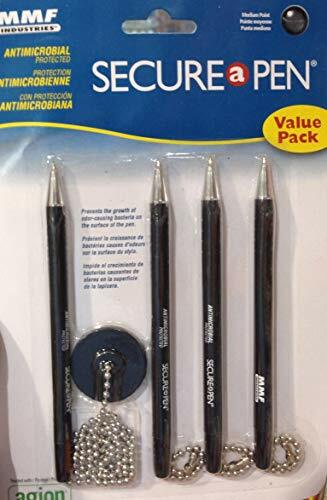 Black ink pens with 0.5mm ballpoint. Prevent your pens from walking away with plastic coil. Adhesive-backed base is simple to apply, no screws, no holes. 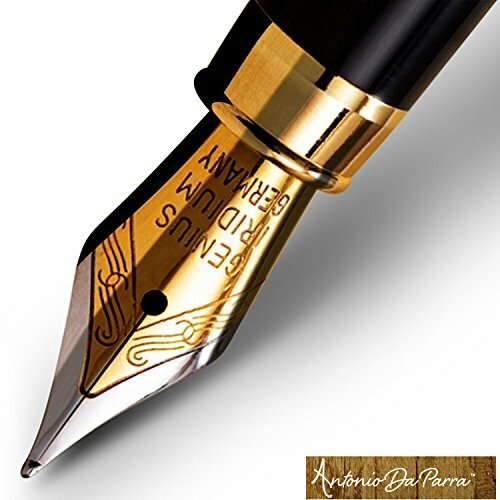 Unique and elegant, Antonio Da Parra fountain pen provides smooth and beautiful writing with each stroke of your hand. Hand-assembled, gold-plated stainless steel nib gives you durability and assures flawless lines with different angles of applied pressure and high-precision of ink flow. This planet-friendly, exclusive collection is made of 100% natural bamboo topped with vintage gold-plated accents for antique, elegant finish. 100% MONEY BACK GUARANTEE for your peace of mind. If you're not happy with your fountain pen we'll either send you a replacement or fully refund your purchase - whichever you choose. Your trust and business is just that important to us. Featuring laser engraving on the pen and complementary case, this attractive wood fountain pen makes a thoughtful gift or a luxurious treat for yourself. The gold iridium medium nib ensures smooth, even ink flow for neat, fluid writing and no ink leakage. The tasteful design makes this professional fountain pen ideal for use at the office, when visiting business clients, or for personal use at home. Whilst the earth-friendly materials mean you can do your bit for the planet by avoiding disposable plastic pens. Medium nib for smooth signature writing and drawing. Antique, stylish and elegant gift for all creative types, writers, business professionals and work colleagues. QUALITY ASSURANCE - This classic bamboo fountain pen comes with a 100% quality guarantee for your complete customer satisfaction. If you don't love it, return it for full refund. quality assurance, and JUGSY will bring you a different shopping experience. pen for the daily use of the modern people, a pen that can follow you for the rest of your life. 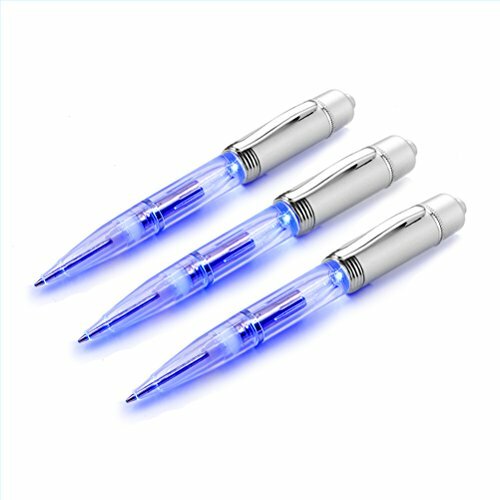 ECONOMICAL PACKAGE PEN LIGHT: Each Pack include 3 x BLUE Light Pens with extra spare refills for recycle using. The ink of Cartridge is black . 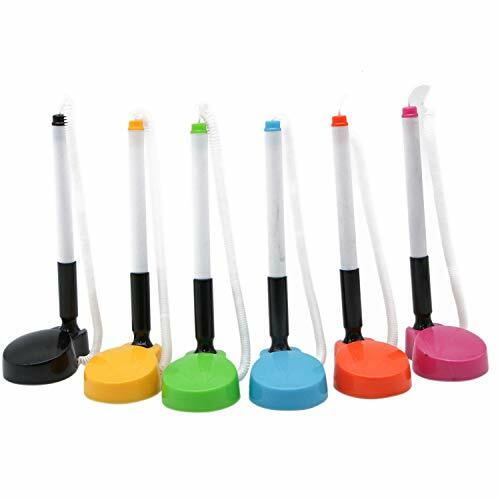 HANDY LIGHT UP PENS: Easy to use, just one click the top button to turn the light ON and OFF , LED Penlight is powered by 3X AG 13 (LR44) cell battery (Installed and Replaceable) :Twist the light barrel to get the pen tip in and out. 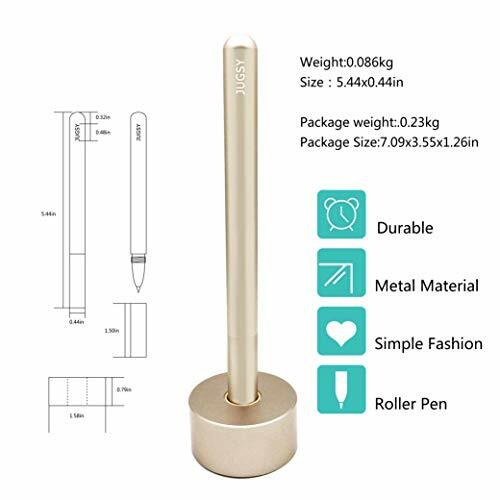 NIGHT WRITER WITHOUT DISTURBING:As a lighted Pen Writing instrument, suitable for who need illumination in low light environments -Write notes, thoughts or reminder without disturbance in the dark at Theater, Restaurant ,Bars , Auditorium, Concert ,Hospital , Dormitory,Bedroom and more . VERSATILE PENLIGHT : Not only you can write it in the dark, but you can read what you write. Idea for your handbag or keep on you because it backs up as a small flashlight for emergencies. BUYING WITH CONFIDENCE: One year replacement for defective units ,30 days no-hassle refund & replacement ,our customer service team will provide you friendly and proactive customer service with no-hassle lifetime guarantee! Want a pen that is SMOOTH & RESILIENT with LONG TIME WRITING? GET THE KING NIB FOUNTAIN PEN SET! Our pen is UNISEX & SUITABLE for EVERYONE. WHAT MAKES THE KING NIB SET SPECIAL? BEST MATERIALS USED Made of METAL, not plastic or wood silver with engravings & black inserts with a pen cap and clip 2 NIBS INCLUDED BROAD & BROAD CALLIGRAPHY that includes CURSIVE & ITALIC writing 2 30ml BOTTLES OF INK Over 2 OUNCES of BLACK & BLUE Ink! 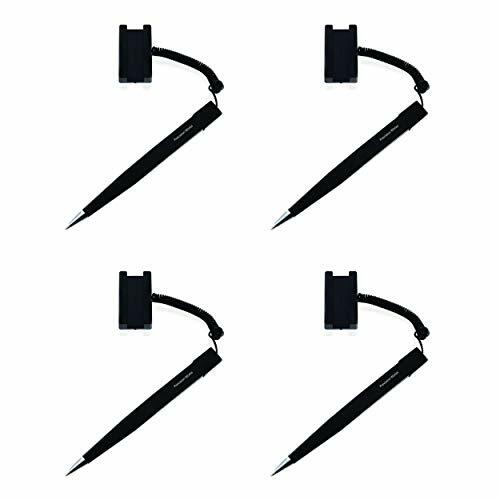 2 CONVERTERS Use to reach the nib FREE STYLUS Suitable for ANY TOUCH SCREEN (Tablet, Smartphone, Computer, Laptop, etc.) ONE-OF-A-KIND CASE Nib-shaped design, made of wood SPECIAL FEATURES: MULTIPLE USES Broad & Broad Calligraphy for Standard, Cursive, & Italic Writing CLASSIC LOOK Top-notch pen design for any special occasion ALL IN ONE SET More Black & Blue Ink than others STYLUS INCLUDED For any touch screen electronic UNIQUE GIFT BOX No other pen box like it on the market Write with ease using the KING NIB FOUNTAIN PEN SET! PACKAGE CONTENTS: 1 Pen with Cap (5.5 x 0.5 ) 2 Nibs (.31 ) 2 30ml Ink Bottles (Black & Blue) 2 Converters 1 Stylus 1 Instructions 1 Duster 1 Notebook 1 Greeting Card 1 Gift Box MONEY BACK GUARANTEE RISK-FREE! Get the KING NIB FOUNTAIN PEN SET by clicking the ADD TO CART button. A WONDERFUL & USEFUL GIFT. MONEY BACK SATISFACTION GUARANTEE: We strive to provide you with the highest quality product and the best customer experience possible; our fountain pen set comes fully backed with a replacement or refund guarantee; if you're not entirely satisfied, please contact us; click Add To Cart now and enjoy your risk-free purchase of the KING NIB FOUNTAIN PEN SET and get the included pen, 2 nibs, 2 large ink bottles, 2 converters, stylus, nib-shaped case, and FREE gifts. Make sure that a pen is always handy for your customers! 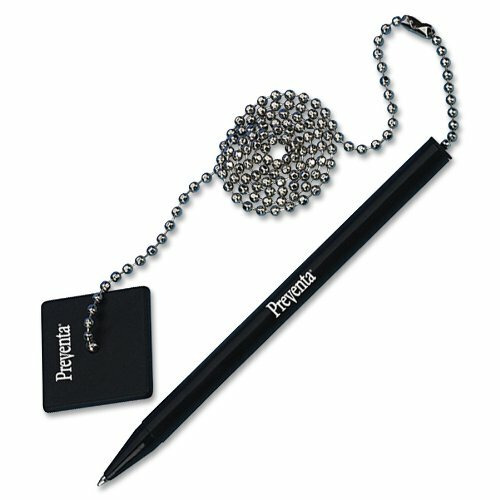 MMF Industries Secure-A-Pen's unique design has a pen with a pull-out 24-inch chain; the chain adheres to the round double-coated adhesive base. The adhesive base adheres to most clean, flat surfaces. When ink runs dry, simply unhook the pen from the base and add a replacement pen. The medium point pens feature a rubberized grip and ridges for writing comfort. MMF Industries is your source for security, organization, and storage products for over 50 years. Agion antimicrobial technology, with Zeomic Type AJ Silver Zeolite A, suppresses the growth of algae, mold, mildew, fungi and bacteria which cause unpleasant odors, discoloration, staining, deterioration and corrosion. 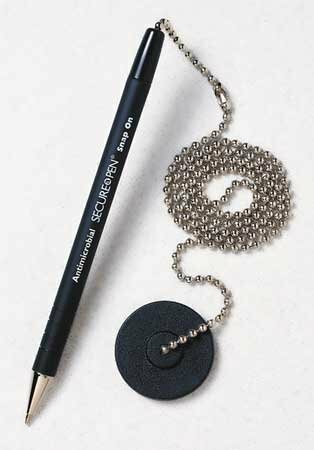 Strong, 24 Inch ball chain keeps your pen securely attached to the base. Refill pen allows for an extra-long life. Built-in Agion antimicrobial technology protects the pen. Pack of 2 counter pens, color comes in random, matt brown color base or matt silver tone color base. 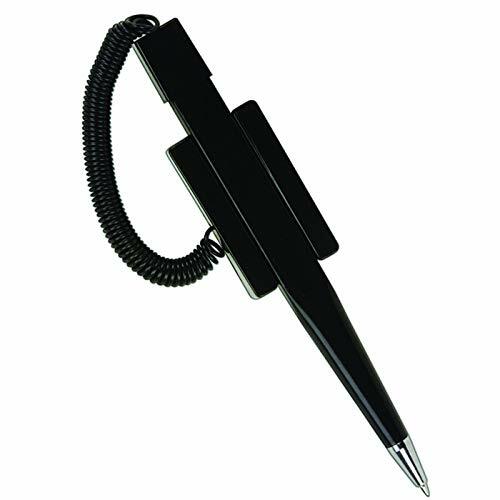 Security pen with a plastic coil that attaches to a base with a stick on tab, blue ink This is sold in a 50 pack. 1 unit = 50 pens.